In XML [XML10], textual content is defined in terms of a sequence of XML characters, where each character is defined by a particular Unicode code point [UNICODE]. Fonts, on the other hand, consists of a collection of glyphs and other associated information, such as font tables. A glyph is a presentable form of one or more characters (or a part of a character in some cases). Each glyph consists of some sort of identifier (in some cases a string, in other cases a number) along with drawing instructions for rendering that particular glyph. In many cases, there is a one-to-one mapping of Unicode characters (i.e., Unicode code points) to glyphs in a font. For example, it is common for a font designed for Latin languages (where the term Latin is used for European languages such as English with alphabets similar to and/or derivative to the Latin language) to contain a single glyph for each of the standard ASCII characters (i.e., A-to-Z, a-to-z, 0-to-9, plus the various punctuation characters found in ASCII). Thus, in most situations, the string "XML", which consists of three Unicode characters, would be rendered by the three glyphs corresponding to "X", "M" and "L", respectively. Composite characters - In various situations, commonly used adornments such as diacritical marks will be stored once in a font as a particular glyph and then composed with one or more other glyphs to result in the desired character. For example, it is possible that a font engine might render the é character by first rendering the glyph for e and then rendering the glyph for ´ (the accent mark) such that the accent mark will appear over the e. In this situation, a single Unicode character maps to multiple glyphs. Glyph substitution - Some typography systems examine the nature of the textual content and utilize different glyphs in different circumstances. For example, in Arabic, the same Unicode character might render as any of four different glyphs, depending on such factors as whether the character appears at the start, the end or the middle of a sequence of cursively joined characters. Different glyphs might be used for a punctuation character depending on inline-progression-direction (e.g., horizontal vs. vertical). In these situations, a single Unicode character might map to one of several alternative glyphs. In some languages, particular sequences of characters will be converted into multiple glyphs such that parts of a particular character are in one glyph and the remainder of that character is in another glyph. In many situations, the algorithms for mapping from characters to glyphs are system-dependent, resulting in the possibility that the rendering of text might be (usually slightly) different when viewed in different user environments. If the author of SVG content requires precise selection of fonts and glyphs, then the recommendation is that the necessary fonts (potentially subsetted to include only the glyphs needed for the given document) be available either as SVG fonts embedded within the SVG content or as WebFonts posted at the same Web location as the SVG content. Throughout this chapter, the term character shall be equivalent to the definition of a character in XML [XML10]. A font consists of a collection of glyphs together with the information (the font tables) necessary to use those glyphs to present characters on some medium. The combination of the collection of glyphs and the font tables is called the font data. The font tables include the information necessary to map characters to glyphs, to determine the size of glyph areas and to position the glyph area. Each font table consists of one or more font characteristics, such as the font-weight and font-style. The geometric font characteristics are expressed in a coordinate system based on the EM box. (The EM is a relative measure of the height of the glyphs in the font; see CSS2 em square.) The box 1 EM high and 1 EM wide is called the design space. This space is given a geometric coordinates by sub-dividing the EM into a number of units-per-em. Note: Units-per-em is a font characteristic. A typical value for units-per-EM is 1000 or 2048. Note: Most often, the (0,0) point in this coordinate system is positioned on the left edge of the EM box, but not at the bottom left corner. The Y coordinate of the bottom of a roman capital letter is usually zero. And the descenders on lower case roman letters have negative coordinate values. Note: Within an OpenType font, for horizontal writing-modes, the ascent and descent are given by the sTypoAscender and sTypoDescender entries in the OS/2 table. For vertical writing-modes, the descent (the distance, in this case from the (0,0) point to the left edge of the glyph) is normally zero because the (0,0) point is on the left edge. The ascent for vertical writing-modes is either 1 em or is specified by the Ideographic top baseline value in the OpenType Base table for vertical writing-modes. In horizontal writing-modes, the glyphs of a given script are positioned so that a particular point on each glyph, the alignment-point, is aligned with the alignment-points of the other glyphs in that script. The glyphs of different scripts, for example, western, northern indic and far-eastern scripts, are typically aligned at different points on the glyph. For example, western glyphs are aligned on the bottoms of the capital letters, northern indic glyphs are aligned at the top of a horizontal stroke near the top of the glyphs and far-eastern glyphs are aligned either at the bottom or center of the glyph. Within a script and within a line of text having a single font-size, the sequence of alignment-points defines, in the inline- progression-direction, a geometric line called a baseline. Western and most other alphabetic and syllabic glyphs are aligned to an "alphabetic" baseline, the northern indic glyphs are aligned to a "hanging" baseline and the far-eastern glyphs are aligned to an "ideographic" baseline. Note: Some fonts may not have values for the baseline tables. Heuristics are suggested for approximating the baseline tables when a given font does not supply baseline tables. SVG further assumes that for each glyph in the font data for a font, there is are two width values, two alignment-baselines and two alignment-points, one each for horizontal writing-modes and the other for vertical writing-modes. (Even though it is specified as a width, for vertical writing-modes the width is used in the vertical direction.) The script to which a glyph belongs determines an alignment-baseline to which the glyph is to be aligned. The inline-progression-direction position of the alignment-point is on the start-edge of the glyph. Properties related to baselines are described below under Baseline alignment properties. In addition to the font characteristics required above, a font may also supply substitution and positioning tables that can be used by a formatter to re-order, combine and position a sequence of glyphs to make one or more composite glyphs. The combination may be as simple as a ligature, or as complex as an indic syllable which combines, usually with some re-ordering, multiple consonants and vowel glyphs. The 'text' element defines a graphics element consisting of text. The XML [XML10] character data within the 'text' element, along with relevant attributes and properties and character-to-glyph mapping tables within the font itself, define the glyphs to be rendered. (See Characters and their corresponding glyphs.) The attributes and properties on the 'text' element indicate such things as the writing direction, font specification and painting attributes which describe how exactly to render the characters. Subsequent sections of this chapter describe the relevant text-specific attributes and properties, particular text layout and bidirectionality. Since 'text' elements are rendered using the same rendering methods as other graphics elements, all of the same coordinate system transformations, painting, clipping and masking features that apply to shapes such as paths and rectangles also apply to 'text' elements. The 'text' element renders its first glyph (after bidirectionality reordering) at the initial current text position, which is established by the x and y attributes on the 'text' element (with possible adjustments due to the value of the 'text-anchor' property, the presence of a 'textPath' element containing the first character, and/or an x, y, dx or dy attributes on a 'tspan', 'tref' or 'altGlyph' element which contains the first character). After the glyph(s) corresponding to the given character is(are) rendered, the current text position is updated for the next character. In the simplest case, the new current text position is the previous current text position plus the glyphs' advance value (horizontal or vertical). See text layout for a description of glyph placement and glyph advance. If a single <coordinate> is provided, then the value represents the new absolute X coordinate for the current text position for rendering the glyphs that correspond to the first character within this element or any of its descendants. If a comma- or space-separated list of <n> <coordinate>s is provided, then the values represent new absolute X coordinates for the current text position for rendering the glyphs corresponding to each of the first <n> characters within this element or any of its descendants. For additional processing rules, refer to the description of the x attribute on the 'tspan' element. The corresponding list of absolute Y coordinates for the glyphs corresponding to the characters within this element. The processing rules for the 'y' attribute parallel the processing rules for the 'x' attribute. Shifts in the current text position along the x-axis for the characters within this element or any of its descendants. Refer to the description of the dx attribute on the 'tspan' element. If the attribute is not specified on this element or any of its descendants, no supplemental shifts along the x-axis will occur. Shifts in the current text position along the y-axis for the characters within this element or any of its descendants. Refer to the description of the dy attribute on the 'tspan' element. If the attribute is not specified on this element or any of its descendants, no supplemental shifts along the y-axis will occur. The supplemental rotation about the current text position that will be applied to all of the glyphs corresponding to each character within this element. Refer to the description of the rotate attribute on the 'tspan' element. If the attribute is not specified on this element or any of its descendants, no supplemental rotations will occur. The author's computation of the total sum of all of the advance values that correspond to character data within this element, including the advance value on the glyph (horizontal or vertical), the effect of properties 'kerning', 'letter-spacing' and 'word-spacing' and adjustments due to attributes dx and dy on 'tspan' elements. This value is used to calibrate the user agent's own calculations with that of the author. The purpose of this attribute is to allow the author to achieve exact alignment, in visual rendering order after any bidirectional reordering, for the first and last rendered glyphs that correspond to this element; thus, for the last rendered character (in visual rendering order after any bidirectional reordering), any supplemental inter-character spacing beyond normal glyph advances are ignored (in most cases) when the user agent determines the appropriate amount to expand/compress the text string to fit within a length of textLength. spacing indicates that only the advance values are adjusted. The glyphs themselves are not stretched or compressed. spacingAndGlyphs indicates that the advance values are adjusted and the glyphs themselves stretched or compressed in one axis (i.e., a direction parallel to the inline-progression-direction). Note that, for a text string that contains <n> characters, the adjustments to the advance values often occur only for <n-1> characters (see description of attribute textLength), whereas stretching or compressing of the glyphs will be applied to all <n> characters. %stdAttrs;, %testAttrs;, %langSpaceAttrs;, externalResourcesRequired, class, style, %PresentationAttributes-Color;, %PresentationAttributes-FillStroke;, %PresentationAttributes-FontSpecification;, %PresentationAttributes-Graphics;, %PresentationAttributes-TextContentElements;, %PresentationAttributes-TextElements;, transform, %graphicsElementEvents;. Example text01 below contains the text string "Hello, out there" which will be rendered onto the canvas using the Verdana font family with the glyphs filled with the color blue. If more <coordinate>s are provided than characters, then the extra <coordinate>s will have no effect on glyph positioning. If more characters exist than <coordinate>s, then for each of these extra characters: (a) if an ancestor 'text' or 'tspan' element specifies an absolute X coordinate for the given character via an x attribute, then that absolute X coordinate is used as the starting X coordinate for that character (nearest ancestor has precedence), else (b) the starting X coordinate for rendering the glyphs corresponding to the given character is the X coordinate of the resulting current text position from the most recently rendered glyph for the current 'text' element. If the attribute is not specified: (a) if an ancestor 'text' or 'tspan' element specifies an absolute X coordinate for a given character via an x attribute, then that absolute X coordinate is used (nearest ancestor has precedence), else (b) the starting X coordinate for rendering the glyphs corresponding to a given character is the X coordinate of the resulting current text position from the most recently rendered glyph for the current 'text' element. If a single <length> is provided, this value represents the new relative X coordinate for the current text position for rendering the glyphs corresponding to the first character within this element or any of its descendants. The current text position is shifted along the x-axis of the current user coordinate system by <length> before the first character's glyphs are rendered. If a comma- or space-separated list of <n> <length>s is provided, then the values represent incremental shifts along the x-axis for the current text position before rendering the glyphs corresponding to the first <n> characters within this element or any of its descendants. Thus, before the glyphs are rendered corresponding to each character, the current text position resulting from drawing the glyphs for the previous character within the current 'text' element is shifted along the X axis of the current user coordinate system by <length>. If more characters exist than <length>s, then for each of these extra characters: (a) if an ancestor 'text' or 'tspan' element specifies a relative X coordinate for the given character via a dx attribute, then the current text position is shifted along the x-axis of the current user coordinate system by that amount (nearest ancestor has precedence), else (b) no extra shift along the x-axis occurs. If the attribute is not specified: (a) if an ancestor 'text' or 'tspan' element specifies a relative X coordinate for a given character via a dx attribute, then the current text position is shifted along the x-axis of the current user coordinate system by that amount (nearest ancestor has precedence), else (b) no extra shift along the x-axis occurs. The corresponding list of relative Y coordinates for the characters within the 'tspan' element. The processing rules for the 'dy' attribute parallel the processing rules for the 'dx' attribute. If more characters are provided than <number>s, then for each of these extra characters: (a) if an ancestor 'text' or 'tspan' element specifies a supplemental rotation for the given character via a rotate attribute, then the given supplemental rotation is applied to the given character, else (b) no supplemental rotation occurs. If the attribute is not specified: (a) if an ancestor 'text' or 'tspan' element specifies a supplemental rotation for a given character via a rotate attribute, then the given supplemental rotation is applied to the given character (nearest ancestor has precedence), else (b) no supplemental rotation occurs. This supplemental rotation has no impact on the rules by which current text position is modified as glyphs get rendered and is supplemental to any rotation due to text on a path and to 'glyph-orientation-horizontal' or 'glyph-orientation-vertical'. The author's computation of the total sum of all of the advance values that correspond to character data within this element, including the advance value on the glyph (horizontal or vertical), the effect of properties 'kerning', 'letter-spacing' and 'word-spacing' and adjustments due to attributes dx and dy on this 'tspan' element or any descendants. This value is used to calibrate the user agent's own calculations with that of the author. If attribute textLength is specified on a given element and also specified on an ancestor, the adjustments on all character data within this element are controlled by the value of textLength on this element exclusively, with the possible side-effect that the adjustment ratio for the contents of this element might be different than the adjustment ratio used for other content that shares the same ancestor. The user agent must assume that the total advance values for the other content within that ancestor is the difference between the advance value on that ancestor and the advance value for this element. %stdAttrs;, %langSpaceAttrs;, class, %graphicsElementEvents;, %testAttrs;, externalResourcesRequired, style, %PresentationAttributes-Color;, %PresentationAttributes-FillStroke;, %PresentationAttributes-FontSpecification;, %PresentationAttributes-Graphics;, %PresentationAttributes-TextContentElements;, lengthAdjust. In situations where micro-level positioning adjustment are necessary for advanced typographic control, the SVG content designer needs to ensure that the necessary font will be available for all viewers of the document (e.g., package up the necessary font data in the form of an SVG font or an alternative WebFont format which is stored at the same Web site as the SVG content) and that the viewing software will process the font in the expected way (the capabilities, characteristics and font layout mechanisms vary greatly from system to system). If the SVG content contains x, y, dx or dy attribute values which are meant to correspond to a particular font processed by a particular set of viewing software and either of these requirements is not met, then the text might display with poor quality. When a single XML character maps to a single glyph - In this case, the i-th value for the x, y, dx, dy and rotate attributes is applied to the glyph that corresponds to the i-th character. When a single XML character maps to multiple glyphs (e.g., when an accent glyph is placed on top of a base glyph) - In this case, the i-th value for the x, y, dx and dy values are applied (i.e., the current text position is adjusted) before rendering the first glyph. The rotation transformation corresponding to the i-th rotate value is applied to the glyphs and to the inter-glyph advance values corresponding to this character on a group basis (i.e., the rotation value creates a temporary new rotated coordinate system, and the glyphs corresponding to the character are rendered into this rotated coordinate system). When multiple XML characters map to a single glyph (e.g., when a ligature is used) - Suppose that the i-th and (i+1)-th XML characters map to a single glyph. In this case, the i-th value for the x, y, dx, dy and rotate attributes all apply when rendering the glyph. The (i+1)-th values, however, for x, y and rotate are ignored (exception: the final rotate value in the list would still apply to subsequent characters), whereas the dx and dy are applied to the subsequent XML character (i.e., the (i+2)-th character), if one exists, by translating the current text position by the given amounts before rendering the first glyph associated with that character. When there is a many-to-many mapping of characters to glyphs (e.g., when three characters map to two glyphs, such as when the first glyph expresses the first character and half of the second character, and the second glyph expresses the other half of the second character plus the third character) - Suppose that the i-th, (i+1)-th and (i+2)-th XML characters map to two glyphs. In this case, the i-th value for the x, y, dx and dy values are applied (i.e., the current text position is adjusted) before rendering the first glyph. The rotation transformation corresponding to the i-th rotate value is applied to both the two glyphs and the glyph advance values for the first glyph on a group basis (i.e., the rotation value creates a temporary new rotated coordinate system, and the two glyphs are rendered into the temporary rotated coordinate system). The (i+1)-th and (i+2)-th values, however, for the x, y and rotate attributes are not applied (exception: the final rotate value in the list would still apply to subsequent characters), whereas the (i+1)-th and (i+2)-th values for the dx and dy attributes are applied to the subsequent XML character (i.e., the (i+3)-th character), if one exists, by translating the current text position by the given amounts before rendering the first glyph associated with that character. and that the word "Hebrew" will be drawn right-to-left. First, the character data and the corresponding values in the dx list will be reordered, such that the text string will be "Latin and werbeH" and the list of values for the dx attribute will be "11 12 13 14 15 0 21 22 23 0 36 35 34 33 32 31". After this re-ordering, the glyphs corresponding to the characters will be positioned using standard left-to-right layout rules. Example tspan02 uses the dx and dy attributes on the 'tspan' element to adjust the current text position horizontally and vertically for particular text strings within a 'text' element. %stdAttrs;, %xlinkRefAttrs;, %testAttrs;, %langSpaceAttrs;, externalResourcesRequired, class, style, %PresentationAttributes-Color;, %PresentationAttributes-FillStroke;, %PresentationAttributes-FontSpecification;, %PresentationAttributes-Graphics;, %PresentationAttributes-TextContentElements;, %graphicsElementEvents;, x, y, dx, dy, rotate, textLength, lengthAdjust. Example tref01 shows how to use character data from a different element as the character data for a given 'tspan' element. The first 'text' element (with id="ReferencedText") will not draw because it is part of a 'defs' element. The second 'text' element draws the string "Inline character data". The third 'text' element draws the string "Reference character data" because it includes a 'tref' element which is a reference to element "ReferencedText", and that element's character data is "Referenced character data". This section describes the text layout features supported by SVG, which includes support for various international writing directions, such as left-to-right (e.g., Latin scripts) and bidirectional (e.g., Hebrew or Arabic) and vertical (e.g., Asian scripts). The descriptions in this section assume straight line text (i.e., text that is either strictly horizontal or vertical with respect to the current user coordinate system). Subsequent sections describe the supplemental layout rules for text on a path. SVG does not provide for automatic line breaks or word wrapping, which makes internationalized text layout for SVG relatively simpler than it is for languages which support formatting of multi-line text blocks. For each 'text' element, the SVG user agent determines the current reference orientation. For standard horizontal or vertical text (i.e., no text-on-a-path), the reference orientation is the vector pointing towards negative infinity in Y within the current user coordinate system. (Note: in the initial coordinate system, the reference orientation is up.) For text on a path, the reference orientation is reset with each character. Based on the reference orientation and the value for property 'writing-mode', the SVG user agent determines the current inline-progression-direction. For left-to-right text, the inline-progression-direction points 90 degrees clockwise from the reference orientation vector. For right-to-left text, the inline progression points 90 degrees counter-clockwise from the reference orientation vector. For top-to-bottom text, the inline-progression-direction points 180 degrees from the reference orientation vector. Based on the reference orientation and the value for property 'writing-mode', the SVG user agent determines the current block-progression-direction. For left-to-right and right-to-left text, the block-progression-direction points 180 degrees from the reference orientation vector because the only available horizontal 'writing-mode's are lr-tb and rl-tb. For top-to-bottom text, the block-progression-direction always points 90 degrees counter-clockwise from the reference orientation vector because the only available top-to-bottom 'writing-mode' is tb-rl. The shift direction is the direction towards which the baseline table moves due to positive values for property 'baseline-shift'. The shift direction is such that a positive value shifts the baseline table towards the topmost entry in the parent's baseline table. In processing a given 'text' element, the SVG user agent keeps track of the current text position. The initial current text position is established by the x and y attributes on the 'text' element. The current text position is adjusted after each glyph to establish a new current text position at which the next glyph shall be rendered. The adjustment to the current text position is based on the current inline-progression-direction, glyph-specific advance values corresponding to the glyph orientation of the glyph just rendered, kerning tables in the font and the current values of various attributes and properties, such as the spacing properties and any x, y, dx and dy attributes on 'text', 'tspan', 'tref' or 'altGlyph' elements. If a glyph does not provide explicit advance values corresponding to the current glyph orientation, then an appropriate approximation should be used. For vertical text, a suggested approximation is the sum of the ascent and descent values for the glyph. Another suggested approximation for an advance value for both horizontal and vertical text is the size of an em (see units-per-em). For each glyph to be rendered, the SVG user agent determines an appropriate alignment-point on the glyph which will be placed exactly at the current text position. The alignment-point is determined based on glyph cell metrics in the glyph itself, the current inline-progression-direction and the glyph orientation relative to the inline-progression-direction. For most uses of Latin text (i.e., 'writing-mode:lr', 'text-anchor:start', and 'alignment-baseline:baseline') the alignment-point in the glyph will be the intersection of left edge of the glyph cell (or some other glyph-specific x-axis coordinate indicating a left-side origin point) with the Latin baseline of the glyph. For many cases with top-to-bottom vertical text layout, the reference point will be either a glyph-specific origin point based on the set of vertical baselines for the font or the intersection of the center of the glyph with its top line (see [CSS2-topline] for a definition of top line). If a glyph does not provide explicit origin points corresponding to the current glyph orientation, then an appropriate approximation should be used, such as the intersection of the left edge of the glyph with the appropriate horizontal baseline for the glyph or intersection of the top edge of the glyph with the appropriate vertical baseline. If baseline tables are not available, user agents should establish baseline tables that reflect common practice. All other position adjustments to the current text position are relative position adjustments. Ligatures only occur when a set of characters which might map to a ligature are all in the same text chunk. Each text chunk represents a separate block of text for alignment due to 'text-anchor' property values. Reordering of characters due to bidirectionality only occurs within a text chunk. Reordering does not happen across text chunks. As in [CSS2-spacing], when the resultant space between two characters is not the same as the default space, user agents should not use ligatures; thus, if there are non-default values for properties 'kerning' or 'letter-spacing', the user agent should not use ligatures. Ligature formation should not be enabled for the glyphs corresponding to characters within different DOM text nodes; thus, characters separated by markup should not use ligatures. As mentioned above, ligature formation should not be enabled for the glyphs corresponding to characters within different text chunks. Sets the initial inline-progression-direction to left-to-right, as is common in most Latin-based documents. For most characters, the current text position is advanced from left to right after each glyph is rendered. (When the character data includes characters which are subject to the Unicode bidirectional algorithm, the text advance rules are more complex. See Relationship with bidirectionality). Sets the initial inline-progression-direction to top-to-bottom, as is common in some Asian scripts, such as Chinese and Japanese. Though hardly as frequent as horizontal, this type of vertical layout also occurs in Latin based documents, particularly in table column or row labels. In most cases, the vertical baselines running through the middle of each glyph are aligned. In some cases, it is required to alter the orientation of a sequence of characters relative to the inline-progression-direction. The requirement is particularly applicable to vertical layouts of East Asian documents, where sometimes narrow-cell Latin text is to be displayed horizontally and other times vertically. Two properties control the glyph orientation relative to the reference orientation for each of the two possible inline-progression-directions. 'glyph-orientation-vertical' controls glyph orientation when the inline-progression-direction is vertical. 'glyph-orientation-horizontal' controls glyph orientation when the inline-progression-direction is horizontal. Fullwidth ideographic and fullwidth Latin text will be set with a glyph-orientation of 0-degrees. Ideographic punctuation and other ideographic characters having alternate horizontal and vertical forms will use the vertical form of the glyph. Text which is not fullwidth will be set with a glyph-orientation of 90-degrees. This reorientation rule applies only to the first-level non-ideographic text. All further embedding of writing-modes or bidi processing will be based on the first-level rotation. This is equivalent to having set the non-ideographic text string horizontally honoring the bidi-rule, then rotating the resultant sequence of inline-areas (one area for each change of glyph direction) 90-degrees clockwise. The determination of which characters should be auto-rotated may vary across User Agents. The determination is based on a complex interaction between country, language, script, character properties, font, and character context. It is suggested that one consult the Unicode TR 11 and the various JIS or other national standards. The value of the angle is restricted to 0, 90, 180, and 270 degrees. The User Agent shall round the value of the angle to the closest of the permitted values. A value of 0deg indicates that all glyphs are set with the top of the glyphs oriented towards the reference orientation. A value of 90deg indicates an orientation of 90 degrees clockwise from the reference orientation. This property is applied only to text written in a vertical 'writing-mode'. The glyph orientation affects the amount that the current text position advances as each glyph is rendered. When the inline-progression-direction is vertical and the 'glyph-orientation-vertical' results in an orientation angle that is a multiple of 180 degrees, then the current text position is incremented according to the vertical metrics of the glyph. Otherwise, if the 'glyph-orientation-vertical' results in an orientation angle that is not a multiple of 180 degrees, then the current text position is incremented according to the horizontal metrics of the glyph. The orientation which the above symbols assume in the diagrams corresponds to the orientation that the Unicode characters they represent are intended to assume when rendered in the user agent. Spacing between the glyphs in the diagrams is usually symbolic, unless intentionally changed to make a point. The diagrams below illustrate different uses of 'glyph-orientation-vertical'. The diagram on the left shows the result of the mixing of full-width ideographic glyphs with narrow-cell Latin glyphs when 'glyph-orientation-vertical' for the Latin characters is either auto or 90. The diagram on the right show the result of mixing full-width ideographic glyphs with narrow-cell Latin glyphs when Latin glyphs are specified to have a 'glyph-orientation-vertical' of 0. This property is applied only to text written in a horizontal 'writing-mode'. The glyph orientation affects the amount that the current text position advances as each glyph is rendered. When the reference orientation direction is horizontal and the 'glyph-orientation-horizontal' results in an orientation angle that is a multiple of 180 degrees, then the current text position is incremented according to the horizontal metrics of the glyph. Otherwise, if the 'glyph-orientation-horizontal' results in an orientation angle that is not a multiple of 180 degrees, then the current text position is incremented according to the vertical metrics of the glyph. The Unicode standard ([UNICODE], section 3.11) defines a complex algorithm for determining the proper directionality of text. The algorithm consists of an implicit part based on character properties, as well as explicit controls for embeddings and overrides. The SVG user agent applies this bidirectional algorithm when determining the layout of characters within a 'text' element. The 'direction' and 'unicode-bidi' properties allow authors to override the inherent directionality of the content characters and thus explicitly control how the elements and attributes of a document language map to this algorithm. These two properties are applicable to all characters who glyphs are perpendicular to the inline-progression-direction. In most cases, the bidirectional algorithm from [UNICODE] produces the desired result automatically, and overriding this algorithm properly is usually quite complex. Therefore, in most cases, authors are discouraged from assigning values to these properties. A more complete discussion of bidirectionality can be found in the "Cascading Style Sheets (CSS) level 2" specification [CSS2-direction]. The processing model for bidirectional text is as follows. The user agent processes the characters which are provided in logical order (i.e., the order the characters appear in the original document, either via direct inclusion or via indirect reference due a 'tref' element). The user agent determines the set of independent blocks within each of which it should apply the Unicode bidirectional algorithm. Each text chunk represents an independent block of text. Additionally, any change in glyph orientation due to processing of properties 'glyph-orientation-horizontal' or 'glyph-orientation-vertical' will subdivide the independent blocks of text further. After processing the Unicode bidirectional algorithm and properties 'direction' and 'unicode-bidi' on each of the independent text blocks, the user agent will have a potentially re-ordered list of characters which are now in left-to-right rendering order. Simultaneous with re-ordering of the characters, the dx, dy and rotate attributes on the 'tspan' and 'tref' elements are also re-ordered to maintain the original correspondence between characters and attribute values. While kerning or ligature processing might be font-specific, the preferred model is that kerning and ligature processing occurs between combinations of characters or glyphs after the characters have been re-ordered. This property specifies the base writing direction of text and the direction of embeddings and overrides (see 'unicode-bidi') for the Unicode bidirectional algorithm. For the 'direction' property to have any effect, the 'unicode-bidi' property's value must be 'embed' or 'bidi-override'. Except for any additional information provided in this specification, the normative definition of the property is in [CSS2-direction]. The 'direction' property applies only to glyphs oriented perpendicular to the inline-progression-direction, which includes the usual case of horizontally-oriented Latin or Arabic text and the case of narrow-cell Latin or Arabic characters rotated 90 degrees clockwise relative to a top-to-bottom inline-progression-direction. Except for any additional information provided in this specification, the normative definition of the property is in [CSS2-unicode-bidi]. The glyphs associated with the characters within a 'text' element are rendered in the logical order of the characters in the original document, independent of any re-ordering necessary to implement bidirectionality. Thus, for text that goes right-to-left visually, the glyphs associated with the rightmost character are rendered before the glyphs associated with the other characters. Additionally, each distinct glyph is rendered in its entirety (i.e., it is filled and stroked as specified by the 'fill' and 'stroke' properties) before the next glyph gets rendered. The 'text-anchor' property is used to align (start-, middle- or end-alignment) a string of text relative to a given point. The 'text-anchor' property is applied to each individual text chunk within a given 'text' element. Each text chunk has an initial current text position, which represents the point in the user coordinate system resulting from (depending on context) application of the x and y attributes on the 'text' element, any x or y attribute values on a 'tspan', 'tref' or 'altGlyph' element assigned explicitly to the first rendered character in a text chunk, or determination of the initial current text position for a 'textPath' element. The rendered characters are aligned such that the start of the text string is at the initial current text position. For Latin or Arabic, which is usually rendered horizontally, this is comparable to left alignment. For Asian text with a vertical primary text direction, this is comparable to top alignment. The rendered characters are aligned such that the end of the text string is at the initial current text position. For Latin text in its usual orientation, this is comparable to right alignment. An overview of baseline alignment and baseline tables can be found above in Fonts, font tables and baselines. One of the characteristics of international text is that there are different baselines (different alignment points) for glyphs in different scripts. For example, in horizontal writing, ideographic scripts, such as Han Ideographs, Katakana, Hiragana, and Hangul, alignment occurs with a baseline near the bottoms of the glyphs; alphabetic based scripts, such as Latin, Cyrillic, Hebrew, Arabic, align a point that is the bottom of most glyphs, but some glyphs descend below the baseline; and Indic based scripts are aligned at a point that is near the top of the glyphs. When different scripts are mixed on a line of text, an adjustment must be made to ensure that the glyphs in the different scripts are aligned correctly with one another. Open Type [OPENTYPE] fonts have a Baseline table (BASE) [OPENTYPE-BASETABLE] that specifies the offsets of the alternative baselines from the current baseline. SVG uses a similar baseline table model that assumes one script (at one font-size) is the "dominant run" during processing of a 'text' element; that is, all other baselines are defined in relation to this dominant run. The baseline of the script with the dominant run is called the dominant baseline. So, for example, if the dominant baseline is the alphabetic baseline, there will be offsets in the baseline table for the alternate baselines, such as the ideographic baseline and the Indic baseline. There will also be an offset for the math baseline which is used for some math fonts. Note that there are separate baseline tables for horizontal and vertical writing-modes. The offsets in these tables may be different for horizontal and vertical writing. The baseline table established at the start of processing of a 'text' element is called the dominant baseline table. Because the value of the 'font-family' property is a list of fonts, to insure a consistent choice of baseline table we define the nominal font in a font list as the first font in the list for which a glyph is available. This is the first font that could contain a glyph for each character encountered. (For this definition, glyph data is assumed to be present if a font substitution is made or if the font is synthesized.) This definition insures a content independent determination of the font and baseline table that is to be used. The value of the 'font-size' property on the 'text' element establishes the dominant baseline table font size. The model assumes that each glyph has a 'alignment-baseline' value which specifies the baseline with which the glyph is to be aligned. (The 'alignment-baseline' is called the "Baseline Tag" in the OpenType baseline table description.) The initial value of the 'alignment-baseline' property uses the baseline identifier associated with the given glyph. Alternate values for 'alignment-baseline' can be useful for glyphs such as a "*" which are ambiguous with respect to script membership. The model assumes that the font from which the glyph is drawn also has a baseline table, the font baseline table. This baseline table has offsets in units-per-em from the (0,0) point to each of the baselines the font knows about. In particular, it has the offset from the glyph's (0,0) point to the baseline identified by the 'alignment-baseline'. The offset values in the baseline table are in "design units" which means fractional units of the EM. CSS calls these "units-per-em" [CSS2-UNITSPEREM]. Thus, the current 'font-size' is used to determine the actual offset from the dominant baseline to the alternate baselines. The glyph is aligned so that its baseline identified by its 'alignment-baseline' is aligned with the baseline with the same name from the dominant baseline table. The offset from the dominant baseline of the parent to the baseline identified by the 'alignment-baseline' is computed using the dominant baseline table and dominant baseline table font size. The font baseline table and font size applicable to the glyph are used to compute the offset from the identified baseline to the (0,0) point of the glyph. This second offset is subtracted from the first offset to get the position of the (0,0) point in the shift direction. Both offsets are computed by multiplying the baseline value from the baseline table times the appropriate font size value. If the 'alignment-baseline' identifies the dominant baseline, then the first offset is zero and the glyph is aligned with the dominant baseline; otherwise, the glyph is aligned with the chosen alternate baseline. The baseline-identifiers below are used in this specification. Some of these are determined by baseline-tables contained in a font as described in [XSL description of Fonts and Font Data]. Others are computed from other font characteristics as described below. This identifies the baseline used by most alphabetic and syllabic scripts. These include, but are not limited to, many Western, Southern Indic, Southeast Asian (non-ideographic) scripts. This identifies the baseline used by ideographic scripts. For historical reasons, this baseline is at the bottom of the ideographic EM box and not in the center of the ideographic EM box. See the "central" baseline. The ideographic scripts include Chinese, Japanese, Korean, and Vietnamese Chu Nom. This identifies the baseline used by certain Indic scripts. These scripts include Devanagari, Gurmukhi and Bengali. This identifies the baseline used by mathematical symbols. This identifies a computed baseline that is at the center of the EM box. This baseline lies halfway between the text-before-edge and text-after-edge baselines. For ideographic fonts, this baseline is often used to align the glyphs; it is an alternative to the ideographic baseline. This identifies a baseline that is offset from the alphabetic baseline in the shift-direction by 1/2 the value of the x-height font characteristic. The position of this baseline may be obtained from the font data or, for fonts that have a font characteristic for "x-height", it may be computed using 1/2 the "x-height". Lacking either of these pieces of information, the position of this baseline may be approximated by the "central" baseline. This identifies the before-edge of the EM box. The position of this baseline may be specified in the baseline-table or it may be calculated. The position of this baseline is normally around or at the top of the ascenders, but it may not encompass all accents that can appear above a glyph. For these fonts the value of the "ascent" font characteristic is used. For ideographic fonts, the position of this baseline is normally 1 EM in the shift-direction from the "ideographic" baseline. However, some ideographic fonts have a reduced width in the inline-progression-direction to allow tighter setting. When such a font, designed only for vertical writing-modes, is used in a horizontal writing-mode, the "text-before-edge" baseline may be less than 1 EM from the text-after-edge. This identifies the after-edge of the EM box. The position of this baseline may be specified in the baseline-table or it may be calculated. For fonts with descenders, the position of this baseline is normally around or at the bottom of the descenders. For these fonts the value of the "descent" font characteristic is used. For ideographic fonts, the position of this baseline is normally at the "ideographic" baseline. For SVG, this is equivalent to text-before-edge. For SVG, this is equivalent to text-after-edge. There are also four baselines that are defined only for horizontal writing-modes. This baseline is the same as the "before-edge" baseline in a horizontal writing-mode and is undefined in a vertical writing mode. This baseline is the same as the "text-before-edge" baseline in a horizontal writing-mode and is undefined in a vertical writing mode. This baseline is the same as the "after-edge" baseline in a horizontal writing-mode and is undefined in a vertical writing mode. This baseline is the same as the "text-after-edge" baseline in a horizontal writing-mode and is undefined in a vertical writing mode. The "dominant-baseline" property is used to determine or re-determine a scaled-baseline-table. A scaled-baseline-table is a compound value with three components: a baseline-identifier for the dominant-baseline, a baseline-table and a baseline-table font-size. Some values of the property re-determine all three values; other only re-establish the baseline-table font-size. When the initial value, "auto", would give an undesired result, this property can be used to explicitly set the desire scaled-baseline-table. If this property occurs on a 'text' element, then the computed value depends on the value of the 'writing-mode' property. If the 'writing-mode' is horizontal, then the value of the dominant-baseline component is 'alphabetic', else if the 'writing-mode' is vertical, then the value of the dominant-baseline component is 'central'. If this property occurs on a 'tspan', 'tref', 'altGlyph' or 'textPath' element, then the dominant-baseline and the baseline-table components remain the same as those of the parent text content element. If the computed 'baseline-shift' value actually shifts the baseline, then the baseline-table font-size component is set to the value of the 'font-size' property on the element on which the 'dominant-baseline' property occurs, otherwise the baseline-table font-size remains the same as that of the element. If there is no parent text content element, the scaled-baseline-table value is constructed as above for 'text' elements. The dominant-baseline and the baseline-table components are set by determining the predominant script of the character data content. The 'writing-mode', whether horizontal or vertical, is used to select the appropriate set of baseline-tables and the dominant baseline is used to select the baseline-table that corresponds to that baseline. The baseline-table font-size component is set to the value of the 'font-size' property on the element on which the 'dominant-baseline' property occurs. The dominant-baseline and the baseline-table remain the same, but the baseline-table font-size is changed to the value of the 'font-size' property on this element. This re-scales the baseline-table for the current 'font-size'. The baseline-identifier for the dominant-baseline is set to be 'alphabetic', the derived baseline-table is constructed using the 'alphabetic' baseline-table in the nominal font, and the baseline-table font-size is changed to the value of the 'font-size' property on this element. The baseline-identifier for the dominant-baseline is set to be 'hanging', the derived baseline-table is constructed using the 'hanging' baseline-table in the nominal font, and the baseline-table font-size is changed to the value of the 'font-size' property on this element. The baseline-identifier for the dominant-baseline is set to be 'ideographic', the derived baseline-table is constructed using the 'ideographic' baseline-table in the nominal font, and the baseline-table font-size is changed to the value of the 'font-size' property on this element. The baseline-identifier for the dominant-baseline is set to be 'mathematical', the derived baseline-table is constructed using the 'mathematical' baseline-table in the nominal font, and the baseline-table font-size is changed to the value of the 'font-size' property on this element. The baseline-identifier for the dominant-baseline is set to be 'central'. The derived baseline-table is constructed from the defined baselines in a baseline-table in the nominal font. That font baseline-table is chosen using the following priority order of baseline-table names: 'ideographic', 'alphabetic', 'hanging', 'mathematical'. The baseline-table font-size is changed to the value of the 'font-size' property on this element. The baseline-identifier for the dominant-baseline is set to be 'middle'. The derived baseline-table is constructed from the defined baselines in a baseline-table in the nominal font. That font baseline -table is chosen using the following priority order of baseline-table names: 'alphabetic', 'ideographic', 'hanging', 'mathematical'. The baseline-table font-size is changed to the value of the 'font-size' property on this element. The baseline-identifier for the dominant-baseline is set to be 'text-after-edge'. The derived baseline-table is constructed from the defined baselines in a baseline-table in the nominal font. The choice of which font baseline-table to use from the baseline-tables in the nominal font is implementation defined. The baseline-table font-size is changed to the value of the 'font-size' property on this element. NOTE: using the following priority order of baseline-table names: 'alphabetic', 'ideographic', 'hanging', 'mathematical' is probably a reasonable strategy for determining which font baseline-table to use. The baseline-identifier for the dominant-baseline is set to be 'text-before-edge'. The derived baseline-table is constructed from the defined baselines in a baseline-table in the nominal font. The choice of which baseline-table to use from the baseline-tables in the nominal font is implementation defined. The baseline-table font-size is changed to the value of the 'font-size' property on this element. See definition of 'text-top' baseline. See definition of 'text-bottom' baseline. If there is no baseline table in the nominal font or if the baseline table lacks an entry for the desired baseline, then the User Agent may use heuristics to determine the position of the desired baseline. This property specifies how an object is aligned with respect to its parent. This property specifies which baseline of this element is to be aligned with the corresponding baseline of the parent. For example, this allows alphabetic baselines in Roman text to stay aligned across font size changes. It defaults to the baseline with the same name as the computed value of the alignment-baseline property. That is, the position of "ideographic" alignment-point in the block-progression-direction is the position of the "ideographic" baseline in the baseline-table of the object being aligned. The value is the dominant-baseline of the script to which the character belongs - i.e., use the dominant-baseline of the parent. The alignment-point of the object being aligned is aligned with the dominant-baseline of the parent text content element. The alignment-point of the object being aligned is aligned with the "before-edge" baseline of the parent text content element. The alignment-point of the object being aligned is aligned with the "text-before-edge" baseline of the parent text content element. The alignment-point of the object being aligned is aligned with the "central" baseline of the parent text content element. The alignment-point of the object being aligned is aligned with the "middle" baseline of the parent text content element. The alignment-point of the object being aligned is aligned with the "after-edge" baseline of the parent text content element. The alignment-point of the object being aligned is aligned with the "text-after-edge" baseline of the parent text content element. The alignment-point of the object being aligned is aligned with the "ideographic" baseline of the parent text content element. The alignment-point of the object being aligned is aligned with the "alphabetic" baseline of the parent text content element. The alignment-point of the object being aligned is aligned with the "hanging" baseline of the parent text content element. The alignment-point of the object being aligned is aligned with the "mathematical" baseline of the parent text content element. The alignment-point of the object being aligned is aligned with the "top" baseline of the parent text content element if the writing-mode is horizontal. Otherwise, the dominant-baseline is used. The alignment-point of the object being aligned is aligned with the "bottom" baseline of the parent text content element if the writing-mode is horizontal. Otherwise, the dominant-baseline is used. The alignment-point of the object being aligned is aligned with the "text-top" baseline of the parent text content element if the writing-mode is horizontal. Otherwise, the dominant-baseline is used. The alignment-point of the object being aligned is aligned with the "text-bottom" baseline of the parent text content element if the writing-mode is horizontal. Otherwise, the dominant-baseline is used. The 'baseline-shift' property allows repositioning of the dominant-baseline relative to the dominant-baseline of the parent text content element. The shifted object might be a sub- or superscript. Within the shifted object, the whole baseline-table is offset; not just a single baseline. The amount of the shift is determined from information from the parent text content element, the sub- or superscript offset from the nominal font of the parent text content element, percent of the "line-height" of the parent text content element or an absolute value. In SVG, the 'baseline-shift' property represents a supplemental adjustment to the baseline tables. The 'baseline-shift' property shifts the baseline tables for each glyph to temporary new positions, for example to lift the glyph into superscript or subscript position, but it does not effect the current text position. When the current text position is adjusted after rendering a glyph to take into account glyph advance values, the adjustment happens as if there were no baseline shift. 'baseline-shift' properties can nest. Each nested 'baseline-shift' is added to previous baseline shift values. There is no baseline shift; the dominant-baseline remains in its original position. The dominant-baseline is shifted to the default position for subscripts. The offset to this position is determined using the font data for the nominal font. Because in most fonts the subscript position is normally given relative to the "alphabetic" baseline, the User Agent may compute the effective position for subscripts for superscripts when some other baseline is dominant. The suggested computation is to subtract the difference between the position of the dominant baseline and the position of the "alphabetic" baseline from the position of the subscript. The resulting offset is determined by multiplying the effective subscript position by the dominant baseline-table font-size. If there is no applicable font data the User Agent may use heuristics to determine the offset. The dominant-baseline is shifted to the default position for superscripts. The offset to this position is determined using the font data for the nominal font. Because in most fonts the superscript position is normally given relative to the "alphabetic" baseline, the User Agent may compute the effective position for superscripts when some other baseline is dominant. The suggested computation is to subtract the difference between the position of the dominant baseline and the position of the "alphabetic" baseline from the position of the superscript. The resulting offset is determined by multiplying the effective superscript position by the dominant baseline-table font-size. If there is no applicable font data the User Agent may use heuristics to determine the offset. The computed value of the property is this percentage multiplied by the computed "line-height" of the 'text' element. The dominant-baseline is shifted in the shift direction (positive value) or opposite to the shift direction (negative value) of the parent text content element by the computed value. A value of "0%" is equivalent to "baseline". The dominant-baseline is shifted in the shift direction (positive value) or opposite to the shift direction (negative value) of the parent text content element by the <length> value. A value of "0cm" is equivalent to "baseline". SVG uses the following font specification properties. Except for any additional information provided in this specification, the normative definition of the property is in [CSS2-fonts]. Any SVG-specific notes about these properties are contained in the descriptions below. This property indicates which font family is to be used to render the text, specified as a prioritized list of font family names and/or generic family names. Except for any additional information provided in this specification, the normative definition of the property is in [CSS2-font-family]. The rules for expressing the syntax of CSS property values can be found at [CSS2-propdef]. This property specifies whether the text is to be rendered using a normal, italic or oblique face. Except for any additional information provided in this specification, the normative definition of the property is in [CSS2-font-style]. This property indicates whether the text is to be rendered using the normal glyphs for lowercase characters or using small-caps glyphs for lowercase characters. Except for any additional information provided in this specification, the normative definition of the property is in [CSS2-font-variant]. This property refers to the boldness or lightness of the glyphs used to render the text, relative to other fonts in the same font family. Except for any additional information provided in this specification, the normative definition of the property is in [CSS2-font-weight]. This property indicates the desired amount of condensing or expansion in the glyphs used to render the text. Except for any additional information provided in this specification, the normative definition of the property is in [CSS2-font-stretch]. If a <length> is provided with one of the unit identifiers (e.g., 12pt or 10%), then the SVG user agent converts the <length> into a corresponding value in the current user coordinate system by applying the rules described in Units. Except for any additional information provided in this specification, the normative definition of the property is in [CSS2-font-size]. This property allows authors to specify an aspect value for an element that will preserve the x-height of the first choice font in a substitute font. Except for any additional information provided in this specification, the normative definition of the property is in [CSS2-font-size-adjust]. Shorthand property for setting 'font-style', 'font-variant', 'font-weight', 'font-size', 'line-height' and 'font-family'. The 'line-height' property has no effect on text layout in SVG. For the purposes of the 'font' property, 'line-height' is assumed to be equal to the value of the 'font-size' property. Conforming SVG Viewers are not required to support the various system font options (caption, icon, menu, message-box, small-caption and status-bar) and can use a system font or one of the generic fonts instead. Except for any additional information provided in this specification, the normative definition of the property is in [CSS2-font]. The rules for expressing the syntax of CSS property values can be found at [CSS2-propdef]. 'kerning' indicates whether the user agent should adjust inter-glyph spacing based on kerning tables that are included in the relevant font (i.e., enable auto-kerning) or instead disable auto-kerning and instead set inter-character spacing to a specific length (typically, zero). 'letter-spacing' indicates an amount of space that is to be added between text characters supplemental to any spacing due to the 'kerning' property. 'word-spacing' indicates the spacing behavior between words. The value of auto indicates that the user agent should adjust inter-glyph spacing based on kerning tables that are included in the font that will be used (i.e., enable auto-kerning). If a <length> is provided, then auto-kerning is disable. Instead, inter-character spacing is set to the given <length>. The most common scenario, other than auto, is to set 'kerning' to a value of 0 so that auto-kerning is disabled. If a <length> is provided without a unit identifier (e.g., an unqualified number such as 128), the SVG user agent processes the <length> as a width value in the current user coordinate system. If a <length> is provided with one of the unit identifiers (e.g., .25em or 1%), then the SVG user agent converts the <length> into a corresponding value in the current user coordinate system by applying the rules described in Units. When a <length> is provided, its value is added to the inter-character spacing value specified by the 'letter-spacing' property. This property specifies spacing behavior between text characters supplemental to any spacing due to the 'kerning' property. For SVG, if a <length> is provided without a unit identifier (e.g., an unqualified number such as 128), the SVG user agent processes the <length> as a width value in the current user coordinate system. Except for any additional information provided in this specification, the normative definition of the property is in [CSS2-letter-spacing]. Except for any additional information provided in this specification, the normative definition of the property is in [CSS2-word-spacing]. Except for any additional information provided in this specification, the normative definition of the property is in [CSS2-text-decoration]. The rules for expressing the syntax of CSS property values can be found at [CSS2-propdef]. Also, the CSS2 definition of 'text-decoration' specifies that the "color of the decorations" remain the same on descendant elements. Since SVG offers a painting model consisting of the ability to apply various types of paint (see Painting: Filling, Stroking and Marker Symbols) to both the interior (i.e., the "fill") and the outline (i.e., the "stroke") of text, for SVG the 'text-decoration' property is defined such that, for an element which has a specified value for the 'text-decoration' property, all decorations on its content and that of its descendants are rendered using the same fill and stroke properties as are present on the given element. If the 'text-decoration' property is specified on a descendant, then that overrides the ancestor. All text decorations except line-through should be drawn before the text is filled and stroked; thus, the text is rendered on top of these decorations. Line-through should be drawn after the text is filled and stroked; thus, the line-through is rendered on top of the text. An offset from the start of the 'path' for the initial current text position, calculated using the user agent's distance along the path algorithm. If a <length> other than a percentage is given, then the startOffset represents a distance along the path measured in the current user coordinate system. If a percentage is given, then the startOffset represents a percentage distance along the entire path. Thus, startOffset="0%" indicates the start point of the 'path' and startOffset="100%" indicates the end point of the 'path'. A value of stretch indicates that the glyph outlines will be converted into paths, and then all end points and control points will be adjusted to be along the perpendicular vectors from the path, thereby stretching and possibly warping the glyphs. With this approach, connected glyphs, such as in cursive scripts, will maintain their connections. %stdAttrs;, %xlinkRefAttrs;, %langSpaceAttrs;, %testAttrs;, externalResourcesRequired, class, style, %PresentationAttributes-Color;, %PresentationAttributes-FillStroke;, %PresentationAttributes-FontSpecification;, %PresentationAttributes-Graphics;, %PresentationAttributes-TextContentElements;, %graphicsElementEvents;, textLength, lengthAdjust. Note that the transform="translate(25,25)" has no effect on the 'textPath' element, whereas the transform="rotate(45)" applies to both the 'text' and the use of the 'path' element as the referenced shape for text on a path. The reference orientation is determined individually for each glyph that is rendered along the path. 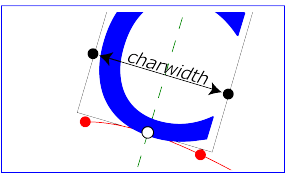 For horizontal text layout flows, the reference orientation for a given glyph is the vector that starts at the intersection point on the path to which the glyph is attached and which points in the direction 90 degrees counter-clockwise from the angle of the curve at the intersection point. For vertical text layout flows, the reference orientation for a given glyph is the vector that starts at the intersection point on the path to which the glyph is attached and which points in the direction 180 degrees from the angle of the curve at the intersection point. Align the glyph vertically relative to the midpoint-on-the-path based on property 'alignment-baseline' and any specified values for attribute dy on a 'tspan' element. In the example above, the 'alignment-baseline' property is unspecified, so the initial value of 'alignment-baseline:baseline' will be used. There are no 'tspan' elements; thus, the baseline of the glyph is aligned to the midpoint-on-the-path. For each subsequent glyph, set a new startpoint-on-the-path as the previous endpoint-on-the-path, but with appropriate adjustments taking into account horizontal kerning tables in the font and current values of various attributes and properties, including spacing properties and 'tspan' elements with values provided for attributes dx and dy. All adjustments are calculated as distance adjustments along the path, calculated using the user agent's distance along the path algorithm. Glyphs whose midpoint-on-the-path are off either end of the path are not rendered. Determine the startpoint-on-the-path using the same method as for horizontal text layout along a path, except that before rendering the first glyph, the horizontal component of the startpoint-on-the-path is adjusted to take into account various vertical alignment text properties and attributes, such as a dy attribute value on a 'tspan' element. Align the glyph horizontally (where horizontal is relative to the glyph's coordinate system) relative to the midpoint-on-the-path based on property 'alignment-baseline' and any specified values for attribute dx on a 'tspan' element. For each subsequent glyph, set a new startpoint-on-the-path as the previous endpoint-on-the-path, but with appropriate adjustments taking into account vertical kerning tables in the font and current values of various attributes and properties, including spacing properties and 'tspan' elements with values provided for attributes dx and dy. All adjustments are calculated as distance adjustments along the path, calculated using the user agent's distance along the path algorithm. When the inline-progression-direction is horizontal, then any x attributes on 'text', 'tspan', 'tref' or 'altGlyph' elements represent new absolute offsets along the path, thus providing explicit new values for startpoint-on-the-path. Any y attributes on 'text', 'tspan', 'tref' or 'altGlyph' elements are ignored. When the inline-progression-direction is horizontal, then any y attributes on 'text', 'tspan', 'tref' or 'altGlyph' elements represent new absolute offsets along the path, thus providing explicit new values for startpoint-on-the-path. Any x attributes on 'text', 'tspan', 'tref' or 'altGlyph' elements are ignored. There are situations such as ligatures, special-purpose fonts (e.g., a font for music symbols) or alternate glyphs for Asian text strings where it is required that a different set of glyphs is used than the glyph(s) which normally corresponds to the given character data. A URI reference either to a 'glyph' element in an SVG document fragment or to an 'altGlyphDef' element. If the reference is to a 'glyph' element and that glyph is available, then that glyph is rendered instead of the character(s) that are inside of the 'altGlyph' element. If the reference is to an 'altGlyphDef' element, then if an appropriate set of alternate glyphs is located from processing the 'altGlyphDef' element, then those alternate glyphs are rendered instead of the character(s) that are inside of the 'altGlyph' element. The <coordinate> values are processed in the same manner as the x attribute on the 'tspan' element, with the following exception: If the referenced alternate glyphs are rendered instead of the Unicode characters inside the 'altGlyph' element, then any absolute X coordinates specified via an x attribute on this element or any ancestor 'text' or 'tspan' elements for Unicode characters 2 through <n> within the 'altGlyph' element are ignored and any absolute X coordinate specified via an x attribute on this element or any ancestor 'text' or 'tspan' elements for the first Unicode character within the 'altGlyph' element sets a new absolute X coordinate for the current text position before rendering the first alternate glyph. The corresponding absolute Y coordinates for rendering the 'altGlyph' element. The <length> values are processed in the same manner as the dx attribute on the 'tspan' element, with the following exception: If the referenced alternate glyphs are rendered instead of the Unicode characters inside the 'altGlyph' element, then any relative X coordinates specified via an dx attribute on this element or any ancestor 'text' or 'tspan' elements for Unicode characters 2 through <n> within the 'altGlyph' element are ignored and any relative X coordinate specified via an dx attribute on this element or any ancestor 'text' or 'tspan' elements for the first Unicode character within the 'altGlyph' element sets a new relative X coordinate for the current text position before rendering the first alternate glyph. The corresponding relative Y coordinates for rendering the 'altGlyph' element. The <number> values are processed in the same manner as the rotate attribute on the 'tspan' element, with the following exception: If the referenced alternate glyphs are rendered instead of the Unicode characters inside the 'altGlyph' element, then any supplemental rotation values specified via an rotate attribute on this element or any ancestor 'text' or 'tspan' elements for Unicode characters 2 through <n> within the 'altGlyph' element are ignored and supplemental rotation values specified via an rotate attribute on this element or any ancestor 'text' or 'tspan' elements for the first Unicode character within the 'altGlyph' element sets a new supplemental rotation angle before rendering the alternate glyphs. %stdAttrs;, %xlinkRefAttrs;, %testAttrs;, %langSpaceAttrs;, externalResourcesRequired, class,, style, %PresentationAttributes-Color;, %PresentationAttributes-FillStroke;, %PresentationAttributes-FontSpecification;, %PresentationAttributes-Graphics;, %PresentationAttributes-TextContentElements; %graphicsElementEvents;. If the references to alternate glyphs do not result in successful identification of alternate glyphs to use, then the character(s) that are inside of the 'altGlyph' element are rendered as if the 'altGlyph' element were a 'tspan' element instead. An 'altGlyph' element either references a 'glyph' element or an 'altGlyphDef' element via its xlink:href attribute or identifies a glyph by means of font selection properties, a glyph identifier and a font format. If the xlink:href attribute is specified, it takes precedence, and the other glyph identification attributes and properties are ignored. The 'altGlyphDef' element defines a set of possible glyph substitutions. In the simplest case, an 'altGlyphDef' contains one or more 'glyphRef' elements. Each 'glyphRef' element references a single glyph within a particular font. If all of the referenced glyphs are available, then these glyphs are rendered instead of the character(s) inside of the referencing 'altGlyph' element. If any of the referenced glyphs are unavailable, then the character(s) that are inside of the 'altGlyph' element are rendered as if there were not an 'altGlyph' element surrounding those characters. In the more complex case, an 'altGlyphDef' contains one or more 'altGlyphItem' elements. Each 'altGlyphItem' represents a candidate set of substitute glyphs. Each 'altGlyphItem' contains one or more 'glyphRef' elements. Each 'glyphRef' element references a single glyph within a particular font. The first 'altGlyphItem' in which all referenced glyphs are available is chosen. The glyphs referenced from this 'altGlyphItem' are rendered instead of the character(s) that are inside of the referencing 'altGlyph' element. If none of the 'altGlyphItem' elements result in a successful match (i.e., none of the 'altGlyphItem' elements has all of its referenced glyphs available), then the character(s) that are inside of the 'altGlyph' element are rendered as if there were not an 'altGlyph' element surrounding those characters. The 'glyphRef' element defines a possible glyph to use. The format of the given font. If the font is in one of the formats listed in [CSS2-src] (e.g., TrueDoc Portable Font Resource or Embedded OpenType), then the <string> must contain the corresponding font format string defined in [CSS2-src] (e.g., truedoc-pfr or embedded-opentype). This value represents the new absolute X coordinate within the font's coordinate system for this glyph. The font coordinate system is based on the em square model described in the "Fonts" chapter of the "Cascading Style Sheets (CSS) level 2" specification [CSS2]. If the attribute is not specified, for the first 'glyphRef' child element, the effect is as if the attribute were set to "0", whereas for subsequent 'glyphRef' child elements, the effect is as if the attribute were set to the end X coordinate from the previous 'glyphRef' element. The corresponding new absolute Y coordinate within the font's coordinate system for this glyph. This value represents the relative X coordinate within the font's coordinate system for this glyph. The glyph is thus shifted by <number> units along the positive X axis within the font's coordinate system supplemental to the absolute X coordinate established by the x attribute (either due to an explicit x attribute or due to default value processing for the x attribute). If the attribute is not specified, the effect is as if the attribute were set to "0". The corresponding number of units within the font's coordinate system to shift the glyph along the positive Y axis relative to the absolute Y coordinate established by the y attribute. %stdAttrs;, %xlinkRefAttrs;, class, style, %PresentationAttributes-FontSpecification;. A 'glyphRef' either references a 'glyph' element in an SVG document fragment via its xlink:href attribute or identifies a glyph by means of font selection properties, a glyph identifier and a font format. If insufficient attributes and properties have been specified to identify a glyph, then the 'glyphRef' is processed in the same manner as when a glyph reference is fully specified, but the given glyph is not available. If the xlink:href attribute is specified, it takes precedence, and the other glyph identification attributes and properties are ignored. SVG supports the standard XML attribute xml:space to specify the handling of white space characters within a given 'text' element's character data. The SVG user agent has special processing rules associated with this attribute as described below. These are behaviors that occur subsequent to XML parsing [XML10] and any construction of a Document Object Model [DOM2]. default (the initial/default value for xml:space) - When xml:space="default", the SVG user agent will do the following using a copy of the original character data content. First, it will remove all newline characters. Then it will convert all tab characters into space characters. Then, it will strip off all leading and trailing space characters. Then, all contiguous space characters will be consolidated. preserve - When xml:space="preserve", the SVG user agent will do the following using a copy of the original character data content. It will convert all newline and tab characters into space characters. Then, it will draw all space characters, including leading, trailing and multiple contiguous space characters. Thus, when drawn with xml:space="preserve", the string "a b" (three spaces between "a" and "b") will produce a larger separation between "a" and "b" than "a b" (one space between "a" and "b"). Any features in the SVG language or the SVG DOM that are based on character position number, such as the x, y, dx, dy and rotate attributes on the 'text', 'tspan', 'tref' 'altGlyph' elements, are based on character position after applying the white space handling rules described here. In particular, if xml:space="default", it is often the case that white space characters are removed as part of processing. Character position numbers index into the text string after the white space characters have been removed per the rules in this section. As the text selection operation proceeds (e.g., the user continues to press the given mouse button), all associated events with other graphics elements are ignored (i.e., the text selection operation is modal) and the SVG user agent shall dynamically indicate which characters are selected by an appropriate highlighting technique, such as redrawing the selected glyphs with inverse colors. As the pointer is moved during the text selection process, the end glyph for the text selection operation is the glyph within the same 'text' element whose glyph cell is closest to the pointer. All characters within the 'text' element whose position within the 'text' element is between the start of selection and end of selection shall be highlighted, regardless of position on the canvas and regardless of any graphics elements that might be above the end of selection point. The following interfaces are defined below: SVGTextContentElement, SVGTextPositioningElement, SVGTextElement, SVGTSpanElement, SVGTRefElement, SVGTextPathElement, SVGAltGlyphElement, SVGAltGlyphDefElement, SVGAltGlyphItemElement, SVGGlyphRefElement. The SVGTextContentElement interface is inherited by various text-related interfaces, such as SVGTextElement, SVGTSpanElement, SVGTRefElement, SVGAltGlyphElement and SVGTextPathElement. The total sum of all of the advance values from rendering all of the characters within this element, including the advance value on the glyphs (horizontal or vertical), the effect of properties 'kerning', 'letter-spacing' and 'word-spacing' and adjustments due to attributes dx and dy on 'tspan' elements. For non-rendering environments, the user agent shall make reasonable assumptions about glyph metrics. The total sum of all of the advance values from rendering the specified substring of the characters, including the advance value on the glyphs (horizontal or vertical), the effect of properties 'kerning', 'letter-spacing' and 'word-spacing' and adjustments due to attributes dx and dy on 'tspan' elements. For non-rendering environments, the user agent shall make reasonable assumptions about glyph metrics. Returns the current text position before rendering the character in the user coordinate system for rendering the glyph(s) that correspond to the specified character. The current text position has already taken into account the effects of any inter-character adjustments due to properties 'kerning', 'letter-spacing' and 'word-spacing' and adjustments due to attributes x, y, dx and dy. If multiple consecutive characters are rendered inseparably (e.g., as a single glyph or a sequence of glyphs), then each of the inseparable characters will return the start position for the first glyph. Returns the current text position after rendering the character in the user coordinate system for rendering the glyph(s) that correspond to the specified character. This current text position does not take into account the effects of any inter-character adjustments to prepare for the next character, such as properties 'kerning', 'letter-spacing' and 'word-spacing' and adjustments due to attributes x, y, dx and dy. If multiple consecutive characters are rendered inseparably (e.g., as a single glyph or a sequence of glyphs), then each of the inseparable characters will return the end position for the last glyph. Returns a tightest rectangle which defines the minimum and maximum X and Y values in the user coordinate system for rendering the glyph(s) that correspond to the specified character. The calculations assume that all glyphs occupy the full standard glyph cell for the font. If multiple consecutive characters are rendered inseparably (e.g., as a single glyph or a sequence of glyphs), then each of the inseparable characters will return the same extent. Returns the rotation value relative to the current user coordinate system used to render the glyph(s) corresponding to the specified character. If multiple glyph(s) are used to render the given character and the glyphs each have different rotations (e.g., due to text-on-a-path), the user agent shall return an average value (e.g., the rotation angle at the midpoint along the path for all glyphs used to render this character). The rotation value represents the rotation that is supplemental to any rotation due to properties 'glyph-orientation-horizontal' and 'glyph-orientation-vertical'; thus, any glyph rotations due to these properties are not included into the returned rotation value. If multiple consecutive characters are rendered inseparably (e.g., as a single glyph or a sequence of glyphs), then each of the inseparable characters will return the same rotation value. Returns the index of the character whose corresponding glyph cell bounding box contains the specified point. The calculations assume that all glyphs occupy the full standard glyph cell for the font. If no such character exists, a value of -1 is returned. If multiple such characters exist, the character within the element whose glyphs were rendered last (i.e., take into account any reordering such as for bidirectional text) is used. If multiple consecutive characters are rendered inseparably (e.g., as a single glyph or a sequence of glyphs), then the user agent shall allocate an equal percentage of the text advance amount to each of the contributing characters in determining which of the characters is chosen. Corresponds to attribute glyphRef on the given element. Corresponds to attribute format on the given element. The SVGGlyphRefElement interface corresponds to the 'glyphRef' element.